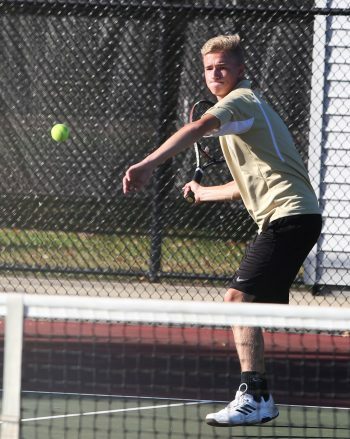 Coach Eric Bowers’ Penn Kingsmen swept through the singles competition on the way to a 4-1 victory against Chesterton in high school tennis Regional action at Portage on Tuesday, Oct. 3. Penn will play Northern Indiana Conference rival South Bend St. Joseph at 5:15 p.m. on Wednesday, Oct. 4, for the Regional Championship. The match will also be on the Portage courts. 1. A.J. Antonelli (Penn) beat Mathew Jewison (Chesterton), 6-3, 6-1. 2. Will Thurin (Penn) beat Nick Hanson (Chesterton), 6-2, 6-0. 3. Aidan Sucharetza (Penn) beat Corydon Gaff (Chesterton), 6-2, 6-1. 1. Blake Ellenwood-Chad Whalen (Chesterton) beat Eric Spaargaren-Aiden O’Day (Penn), 6-2, 6-1. 2. Maity Spitters-Nick Casetti (Penn) beat Paul Petro-Luke Liapes (Chesterton), 6-2, 7-5.